At the 81st Geneva International Motor Show, the Alfa Romeo 4C Concept will make its debut, a compact “supercar” which represents the true essence of a sports car, according to the brand's values: performance, Italian style and technical excellence aimed at maximum driving pleasure in total safety. This car is not simply an exercise in style created for the Motor Show; it will be on sale in 2012 and is set to reinforce Alfa Romeo's global growth. 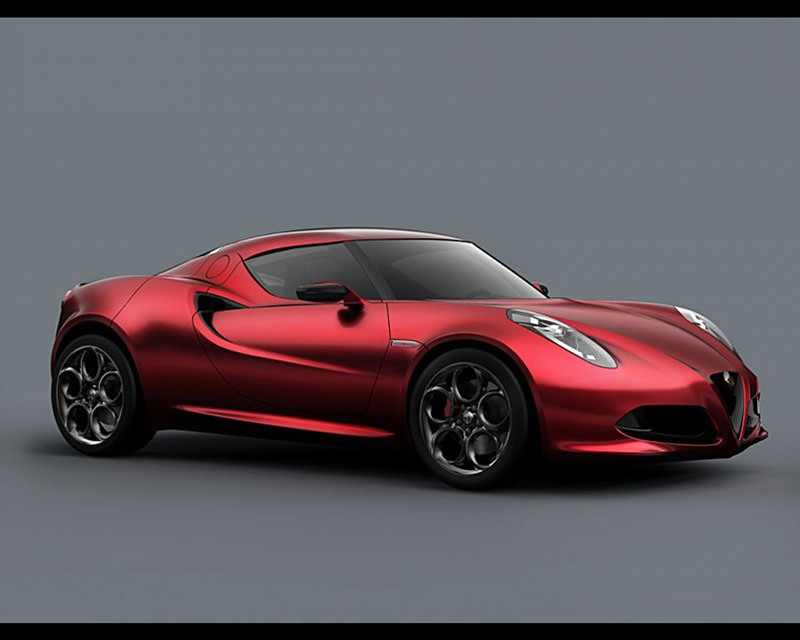 The new Alfa Romeo 4C Concept presents the classic formula of the two-seater, rear-wheel drive coupé with its engine at the centre, a length of approximately 4 metres and a wheelbase of less than 2.4 metres: dimensions which serve both to emphasise the compact size of the car and to accentuate its agility. Distinguished by its graceful and clean external lines, the same principles are also applied to the inside, with the Concept's specific on-board design maintaining features and devices which directly reflect the car’s sporting spirit. On the Alfa Romeo 4C Concept technology and materials derived from the 8C Competizione 2006 find a home - carbon, aluminium, rear-wheel drive - and technology derived from Alfa Romeo models currently on sale: the 1750 turbo petrol engine with direct injection, the "Alfa TCT" twin dry clutch transmission and the Alfa DNA dynamic control selector. Born from the experience acquired through the Alfa Romeo 8C Competizione and 8C Spider models ( such as the Alfa Romeo 8C 2300 Spider Mille Miglia 1932 ), the new Alfa Romeo 4C Concept 2011 car shares its rear-wheel drive with the exclusive supercars as well as its philosophy based on achieving maximum driving pleasure and the proverbial Alfa Romeo road handling. This is an objective which the 8C Competizione and the 8C Spider pursue mainly through their increased power, while the Alfa Romeo 4C Concept follows the route of limited weight, made possible by extensive use of carbon, which also plays a structural role and guarantees exceptional agility with a weight/power ratio which is lower than 4 kg/HP. The chassis supports a body crafted completely from carbon, inside which there is space for the driver and passenger, while the rear frame structure and the crash boxes use aluminium extensively. The final result is a significant reduction in weight, limited to less than 850 kg, as well as the optimisation of the vehicle's centre of gravity, which gives the advantage of increased agility and drivability on the most challenging roads. The name “4C Concept” is suggestive of the sports driving pleasure which only the spectacular "4 cylinder" 1750 Turbo Petrol engine which offers over 200 HP can bring. Already featured on a number of models in production, for example the Giulietta Quadrifoglio Verde, the engine boasts cutting-edge technical solutions such as direct injection, dual continuous variable valve timing, turbocharger and the revolutionary scavenging control system which eliminates turbo lag. 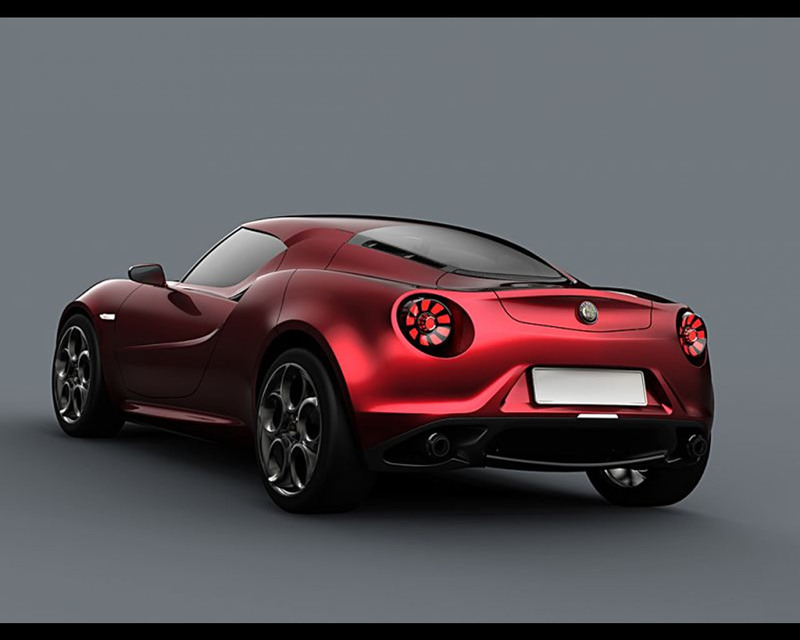 Located centrally in the rear of the vehicle, the engine in the Alfa Romeo 4C Concept ensures performance which matches or exceeds that of a 3 litre engine whilst still delivering the moderate fuel consumption which is typical of a compact, 4 cylinder engine. Coupled with the new automatic “Alfa TCT” twin dry clutch transmission, launched only a few months ago on the MiTo and which will soon be available on the Giulietta, the powerful 1750 Turbo petrol engine allows the 4C Concept to reach a top speed of over 250 km/h and to accelerate from 0 to 100km in under 5 seconds. The Alfa Romeo 4C Concept has an extremely sophisticated suspension layout (high quadrilateral at the front, MacPherson at the rear) to ensure maximum agility and road handling. This solution, along with the rear-wheel drive and the extraordinary weight/power ratio, ensures Alfa Romeo driving pleasure, enhanced even further by the weight distribution (40% on the front axle and 60% on the rear axle). 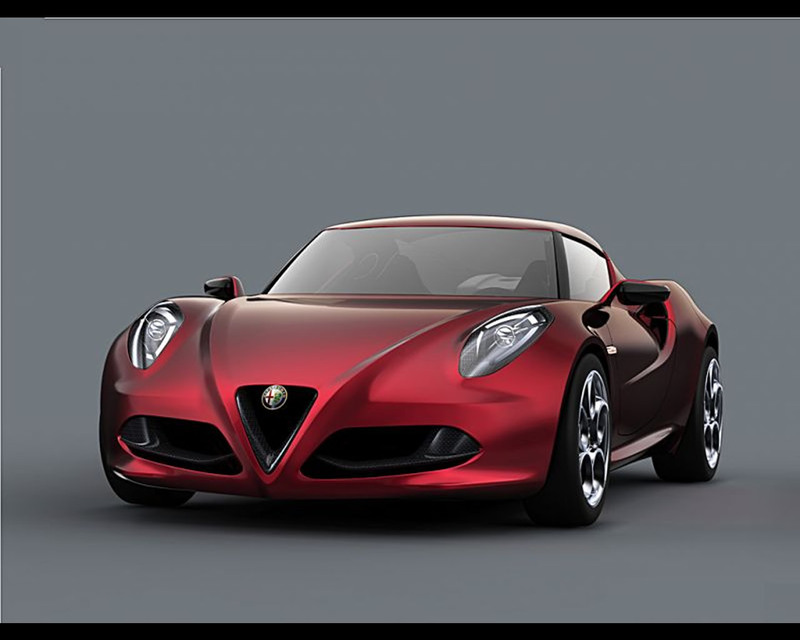 The Concept takes up the Brand's sporting tradition, taking us back to its origins, when agility and the weight/power ratio were the keys to a successful racing vehicle, and combining these aspects with the Alfa Romeos which take to the road every day.